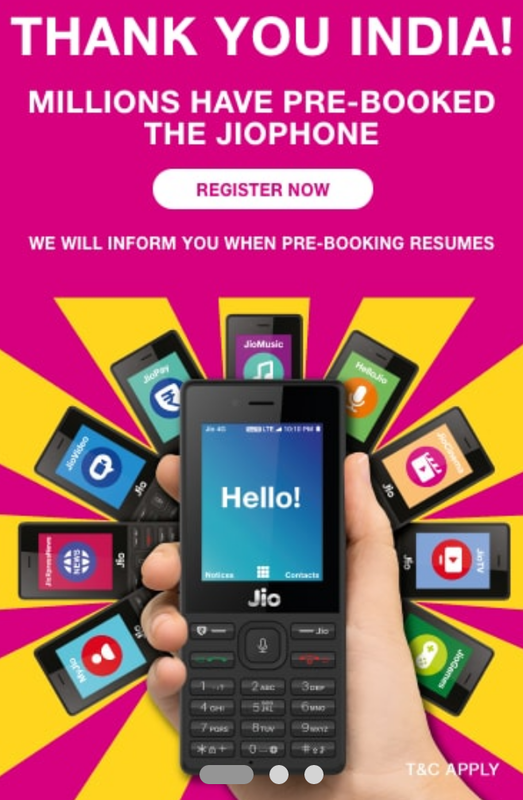 Home Tech News Jio Phone Booking Suspended Due To Million Booking Of Jio Phone . Jio Phone Booking Suspended Due To Million Booking Of Jio Phone . According to media reports, Jio Phone bookings had already crossed 3 million mark within a couple of hours from opening. As per executives in trade channels, the final number likely to be several times higher by the close of the day, as accounting of the total bookings at ​500 Rs apiece was still being done. In homepage of official site of jio register now option is showing instead of book now option . Through which now customers can register for jio phone . And customers will recieve information when jio phone booking will be resume . 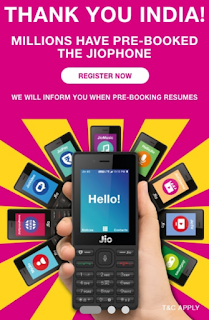 Jio Phone Registration Process :- Complete Details About Registration Process Of Jio Phone . The delivery of jio phone for those customers whose already booked jio phone will be start from September . To make the deliveries, Reliance has launched a massive exercise by roping in logistics companies as well as its own workforce. It plans to deliver 1 lakh handsets every day to meet the rush. The Jio phone is targeted at 500 million . The customers who booked can also track the status of delivery of jio phone by dialing the number ‘18008908900’. Users will need to share their registered mobile number to know the status of JioPhone. This can be done via MyJio app as well. Open the app and click on ‘My Vouchers’ tab.